Are you intrigued or curious about encaustic painting, an ancient painting process using pigmented molten beeswax? Are you art enthusiast wanting to discover a new versatile creative process in an intimate studio setting? 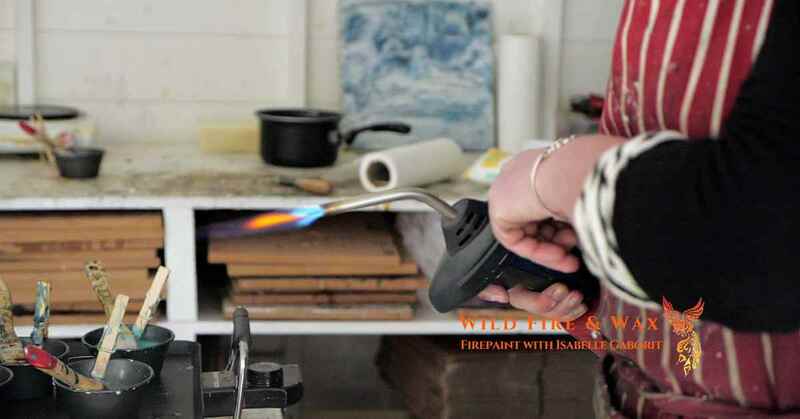 At the Wild Fire & Wax studio and in venues around Ireland, I provide an artistic workshop with a difference, where participants are coached to explore their own ‘fiery side’ via the medium of encaustic painting, an ancient painting process involving molten pigmented beeswax and blowtorch. Through workshops, I help my customers to awaken, unfold and expand their talents and creativity through the exploration of a versatile, easy and effective artistic method so they have the opportunity to express what fires them up and create beautiful atmospheric artwork in a relax and inspiring environment. Art Classes for everyone: absolute beginners and developing artists alike. During the workshops, I introduce the participants to the basic techniques of encaustic painting, sharing its spontaneous virtues of working with texture and colors and its versatility with building up layers.You will have the opportunity to learn easy and effective techniques in a fun and relax atmosphere and create beautiful artworks to bring home. ∴ Resources on Safety, ventilation, correct working temperatures, and proper use of equipment. ∴ Appropriate supports and grounds, palette, brushes, colours and studio set up. ∴ Different ways to apply paint, fusing options. ∴ How to achieve a smooth/textured surface. For introductory workshops available dates please click here. For level 2 workshops available dates please click here. Important note: Due to the high demand for my workshops this year, all places on all workshops are limited and sold on a first-booked, first-served basis, which means that you will need to secure your space via my website as early as possible to avoid disappointment.